The original 23.86 mile-long structure, which now carries the Southbound traffic, was designed by the firm of Palmer & Baker. When opened in 1956, the structure was the longest bridge in the world by more than 15 miles. In building the bridge, which took just fourteen months, assembly-line, mass-production methods were utilized for the first time in the construction of a bridge. It was designed to employ hundreds of identical, hollow concrete pilings, concrete caps, and pre-stressed deck sections manufactured at an on-shore facility and barged into place. Engineering News-Record acclaimed the project to be "a bold venture requiring unusual foresight, ingenuity and resourcefulness." Erected 2013 by American Society of Civil Engineers. Marker series. 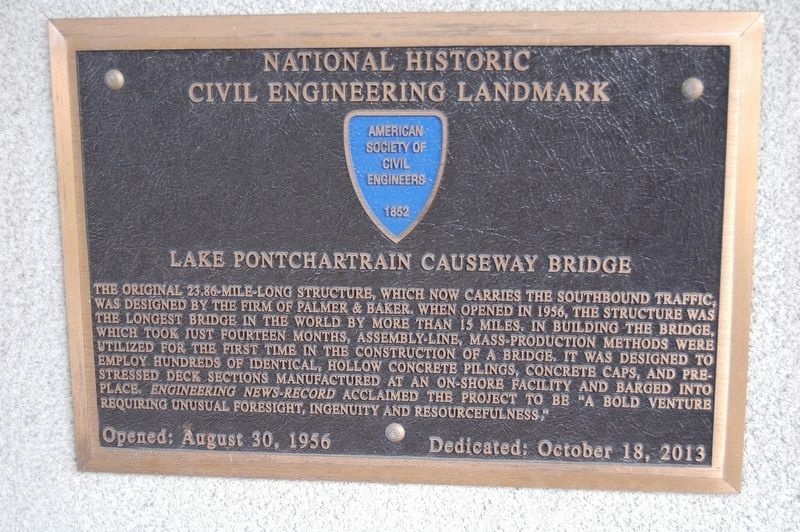 This marker is included in the Historic Civil Engineering Landmarks marker series.
. Marker is on North Causeway Boulevard, on the right when traveling south. Touch for map. Located and mounted on the Causeway Toll Plaza building. 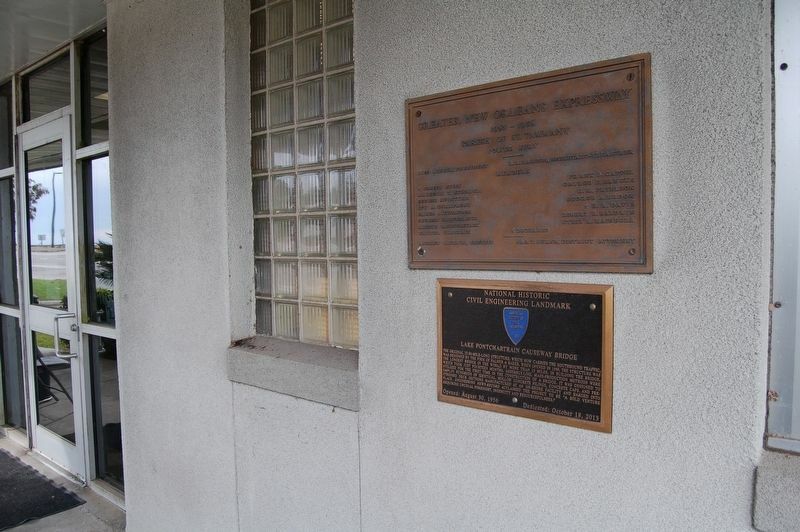 Marker is at or near this postal address: 100 North Causeway Boulevard, Mandeville LA 70448, United States of America. Touch for directions. Other nearby markers. At least 8 other markers are within 5 miles of this marker, measured as the crow flies. Lake Pontchartrain Causeway (here, next to this marker); Greater Mandeville Veterans Memorial (approx. one mile away); Our Lady Of The Lake Church (approx. 1.6 miles away); Battle of Lake Pontchartrain (approx. 2.3 miles away); Sugar Mill Operation (approx. 3.9 miles away); Fontainebleau Plantation Sugar Mill (approx. 3.9 miles away); Steam Powered "Groundhog" Sawmill (approx. 4.1 miles away); Madisonville (approx. 4½ miles away). Touch for a list and map of all markers in Mandeville. More. Search the internet for Lake Pontchartrain Causeway Bridge. Credits. This page was last revised on November 20, 2016. This page originally submitted on November 20, 2016, by Cajun Scrambler of Assumption, Louisiana. This page has been viewed 184 times since then and 9 times this year. Photos: 1, 2. submitted on November 20, 2016.